Colocalization of the microtubule anchoring factor LL5α (red) with integrin α6 (blue) and laminin (green) in the epithelium of mouse small intestine. LL5α is localized to the basal cell cortex attached to the laminin BMs. Overall findings from this publication showed that signaling from laminin-integrin associations play a role in attaching microtubule plus ends to the epithelial basal cell cortex. This image is the original data file from Fig. 4D, J Cell Biol (2010) 189 (5):901-917. 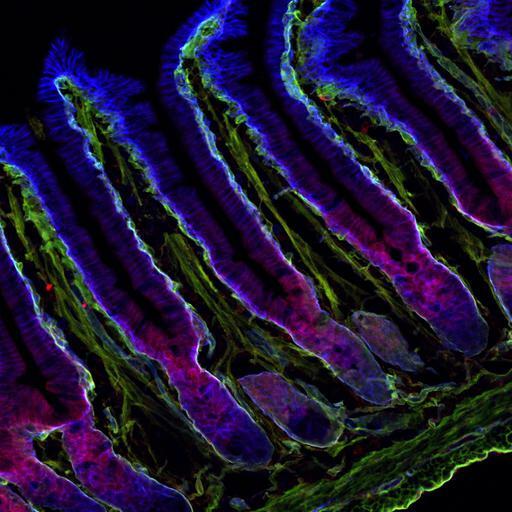 Small intestine from C57BL6/J strain mice (8 wk of age) was prepared by perfusion fixation, processed as described previously (Nakatani et al., 2004), and immunostained for laminin (Cy2, 488 nm laser), LL5a (rhodamine red-X, 543 nm laser) and integrin a6 (Cy5, 633 nm laser), and observed using a confocal laser-scanning microscope system.